October 16, 2013 at 5:24 pm EDT | by Lou Chibbaro Jr.
As the federal government’s shutdown entered its third week, LGBT and AIDS advocates expressed alarm that community-based AIDS service providers in D.C. and across the nation could be forced to lay off employees and curtail services if the shutdown and its related funding reductions continued much longer. Democratic and Republican leaders in the Senate announced a bipartisan agreement on Wednesday calling for raising the debt ceiling and ending the government shutdown. Although political observers thought there were enough votes to approve the agreement in both the Senate and the House, no one was certain whether the GOP-controlled House would pass the compromise bill initiated in the Senate. Leonard Hirsch, president of the LGBT federal workers group Federal GLOBE, said that, like all federal workers, thousands of furloughed LGBT federal employees continued as of Wednesday to struggle without a paycheck. The shutdown, which closed many but not all federal agencies, left more than 800,000 federal employees furloughed, according to the U.S. Office of Personnel Management. With the federal government being the largest employer in the D.C. metro area, the area is said to have been affected the most by the shutdown. “Everyone that I know in the federal workforce is very frustrated that they’re not allowed to be getting work done, that things are piling up, that their clients are not being served,” said Hirsch, who has worked at the Smithsonian Institution for 24 years. 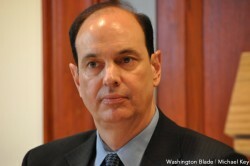 Hirsch said he and nearly all the federal workers he knows – LGBT and straight – are especially troubled over accusations by Obama administration critics, including former GOP vice presidential candidate Sarah Palin, that the U.S. Park Service is being disrespectful to veterans and other citizens by denying them access to the World War II Memorial and other monuments in Washington. 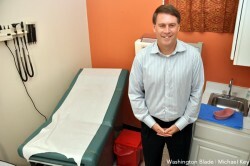 Don Blanchon, executive director of Whitman-Walker Health, the D.C. area’s largest private agency providing medical and social services to people with HIV and the LGBT community, said Whitman-Walker has “weathered” the federal shutdown so far largely because it accumulated a substantial reserve fund over the past several years. “By and large, the impact of the shutdown directly on our operations and patient care is minimal,” he told the Blade on Monday. “We’re open. We’re serving patients. And for the foreseeable future we don’t see this shutdown causing us a tremendous amount of difficulty right now,” he said. 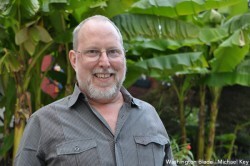 But Blanchon noted that Whitman-Walker along with other D.C. community-based health groups serving people with HIV has been hit by D.C.’s inability to pay its Medicaid reimbursements. Under a federal law, D.C. is prohibited from spending its own money obtained through local tax revenue if Congress doesn’t approve the city’s annual budget. With Congress deadlocked over the federal budget, under which the D.C. budget falls, the city has been unable to spend much of its own funds since the federal shutdown began on Oct. 1 at the start of the new fiscal year. Since D.C.’s budget is intertwined with the federal budget, D.C. has been impacted by the shutdown in a way that no other city or state has, a development that has infuriated D.C. Mayor Vincent Gray. At an Oct. 11 town hall meeting Gray said the shutdown has forced the city to tap into its reserve funds to keep city agencies open and to continue city services through the end of this week or next, at which time he said the usable portion of the reserve fund would be depleted. But Gray said the reserve fund wasn’t large enough to enable the city to cover $90 million in Medicaid reimbursement payments to the city’s private clinics and medical providers that take Medicaid patients during the previous week. Blanchon said the delay in the Medicaid payments resulted in Whitman-Walker not receiving about $70,000 in reimbursements for its Medicaid patients. While Whitman-Walker’s reserve fund will enable the LGBT health provider to “weather the storm” for the time being, as Blanchon put it, other community-based health providers don’t have such a financial cushion, officials with those groups have said. Some of them have already been forced to lay off employees and curtail services, including HIV-related services, the officials have said. 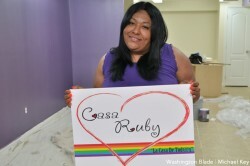 “We’re already seeing services cut back for LGBT and Latino community clients,” said Ruby Corado, director of the LGBT community center Casa Ruby. Corado said Casa Ruby, which is funded largely by private donors, wasn’t immediately affected by the shutdown. But Simmons said Us Helping Us won’t be able to operate without possible service interruptions if the federal shutdown continues indefinitely. Although his organization doesn’t have the type of reserve fund that Whitman-Walker has, Simmons said much of the group’s federal funding for the fiscal year has already been appropriated by Congress through various grants. He said the payments through those grants, including one from the U.S. Centers for Disease Control and Prevention, have continued uninterrupted during the shutdown. Similar to other HIV service providers in D.C. and across the nation, funding from the Ryan White federal AIDS program also had been appropriated by Congress prior to the shutdown, enabling groups receiving Ryan White grants to continue to receive the funds through the rest of the fiscal year, according to Carl Schmid, deputy director of the AIDS Institute, a national HIV/AIDS advocacy organization. “Luckily, the grants went out in April,” said Schmid in referring to the Ryan White program, which he said provides millions of dollars to AIDS groups across the country. But Schmid cautioned that if the federal shutdown were to continue, AIDS service providers would be adversely impacted in a number of ways. One immediate effect, he said, was federal officials who provide support for the processing of Ryan White grant applications were furloughed as soon as the shutdown began on Oct. 1. Schmid noted that most of the federal officials that administer the Obama administration’s national AIDS strategy program as well as the White House Office on AIDS Policy were also on furlough since Oct. 1. Michael Cole-Schwartz, a spokesperson for the Human Rights Campaign, told the Blade that LGBT-related implications of the shutdown could, among other things, include a cutback in the enforcement of the federal hate crimes act that covers hate crimes targeting LGBT people. Cole-Schwartz said the furloughing of Justice Department personnel could negatively impact enforcement of both the hate crimes law and Title IX of an existing civil rights statute that protects women and transgender people from gender-related discrimination.